Elisa Bertino, a professor of computer science at Purdue University and acting research director for the Center for Education and Research in Information Assurance and Security, was named editor-in-chief of IEEE Transactions on Secure and Dependable Computing. 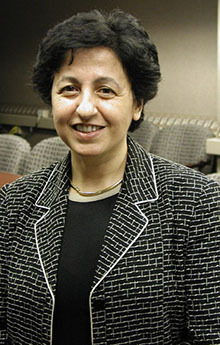 Bertino received the IEEE Computer Society Technical Achievement Award in 2002 for outstanding contributions to database systems and database security and advanced data management systems, and the 2005 Tsutomu Kanai Award for pioneering and innovative research contributions to secure distributed systems. IEEE Computer Society produces peer-reviewed, technical journals, magazines, books, and conference publications, in addition to online courses, certification programs, conferences, career development services, and networking opportunities. IEEE Computer Society publications are led and governed by the Publications Board, which includes operations committees for each publishing line. The IEEE Computer Society provides up-to-date, easily accessible information for computing professionals, and serves as a source for technology information, inspiration and collaboration.